Secondhand Lions is a family-friendly fable about an adolescent boy dropped off at the ramshackle ranch of his eccentric great-uncles in the summer of 1962. On the steps of their Texas farmhouse, young Walter (Haley Joel Osment) acquaints himself with the uncles, Garth (Michael Caine) and Hub (Robert Duvall), and becomes determined to discover where they had been for many years. But, Walter, raised on a steady diet of deceit from his mother, Mae (Kyra Sedgwick), must decide if he can trust the stories that he hears about the uncles’ alleged long-ago exploits. The film received mixed reviews from critics upon its September 19, 2003 release. Over the years, however, it has earned a decidedly more favorable reception from viewers drawn to the warmhearted tale. © 2003 New Line Productions, Inc.
To learn more about the career of director Tim McCanlies, and his earlier film Dancer, Texas Pop. 81 (1998), grab the book Chainsaws, Slackers, and Spy Kids: Thirty Years of Filmmaking in Austin, Texas, by author Alison Macor. Secondhand Lions was filmed primarily around Austin, Texas. SPOILER ALERT: The descriptions below include plot points of the film. If you haven't seen the movie, you can buy the Blu-ray on Amazon. Shortly after arriving at the uncles’ house, a frustrated Walter attempts to call his mother from a local payphone. Later, Hub and Garth take Walter to lunch at a local barbecue joint, where their meal is interrupted by rowdy hooligans who learn a valuable lesson from Hub. These may be separate places in the film, but both sequences were filmed at the Cele Store, 18726 Cameron Rd, Manor, TX 78653. They’ve been serving barbecue for over 50 years at the store in the small community of Cele (pronounced “seal”), so be sure to visit when they're open. The upcoming documentary Also Starring Austin features scenes of Austin-area filming locations over the years, including the Cele Store. As thanks for a minor bit of location assistance I was able to offer, Also Starring Austin's producer/director Mike Blizzard and associate producer Lara Morgan invited me to lunch at the iconic restaurant. For a fan of barbecue and filming locations, it doesn’t get much better, so I'm grateful for the experience, and I wish them much success. Follow Also Starring Austin on Facebook for updates. Copeland Feed & Milling Co.
After Hub and Garth buy a used lion, they drive with Walter to the Copeland Feed & Milling Co to pick up some lion feed. The building is located at 400 FM 1466, Coupland, TX 78615, and is obviously named using a variation of the town's name. My understanding is that it was actually a cotton gin, rather than a feed mill, but it isn’t currently serving any public purpose. It's heavily overgrown now, so please don't trespass. Reference: In his director's commentary on the Secondhand Lions Blu-ray, Tim McCanlies mentions that this scene was filmed in Coupland. Garth tells Walter a wild story about some of Hub’s adventures in Africa. In flashback, we see the gorgeous Princess Jasmine (Emmanuelle Vaugier) in her palace when she learns about a daring rescue performed by Young Hub (Christian Kane). Jasmine’s palace scenes were filmed at the "Commodore" Perry Estate, 4100 Red River Street, Austin, TX 78751. The venue is currently under construction to become a "boutique hotel." Reference: In his director's commentary on the Secondhand Lions Blu-ray, Tim McCanlies mentions that this scene was filmed at the Perry mansion. In Garth’s recounting, Hub and Jasmine are seen shopping in an exotic souk when mercenaries, sent by The Sheik (Adam Ozturk), spring from the shadows to attack the couple. In "movie magic" style, souk scenes were filmed at Symphony Square, 1101 Red River St, Austin, TX 78701. 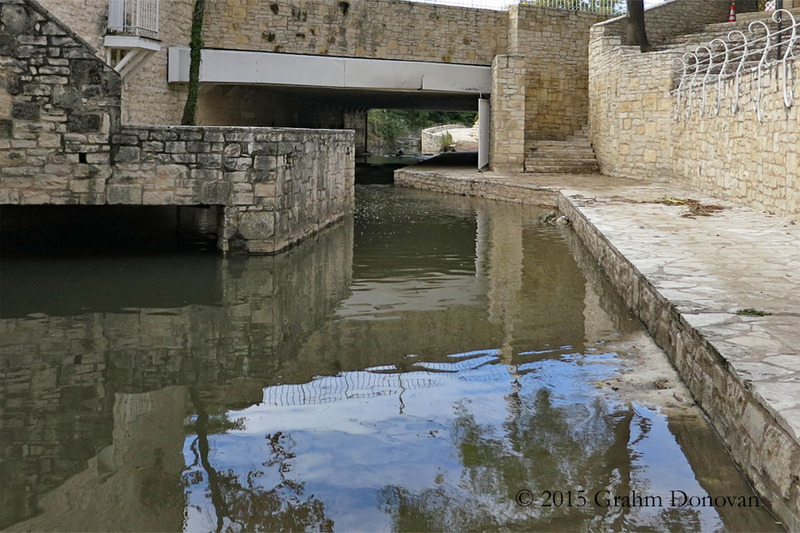 It's certainly a tribute to the crew that the home of the Austin Symphony, hidden just under busy downtown streets, appears to be such a convincing location. Reference: In his director's commentary on the Secondhand Lions Blu-ray, Tim McCanlies mentions that this scene was filmed in Symphony Square. Early in the film, Mae drives over a bridge as she's taking Walter to the uncles' house. Later, the pair have a confrontation on the bridge when Mae takes Walter from the to the uncles' house. 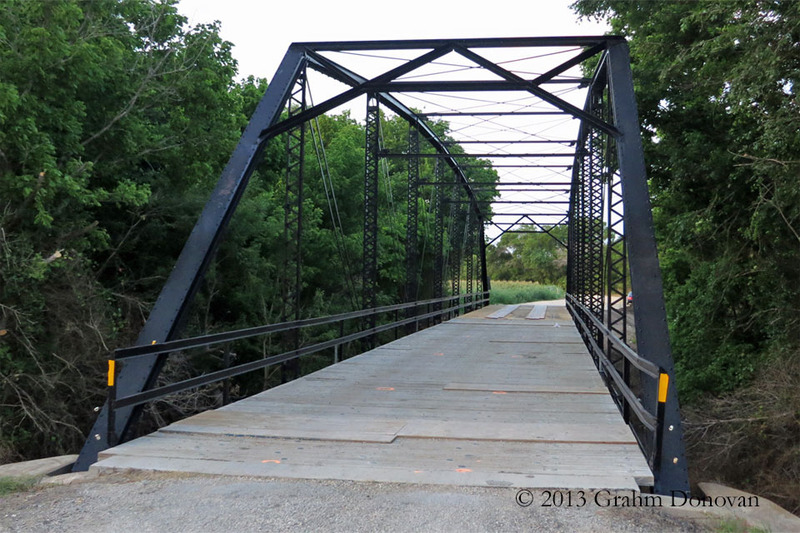 The bridge is located over Brushy Creek along County Road 456, Coupland, TX 78615. 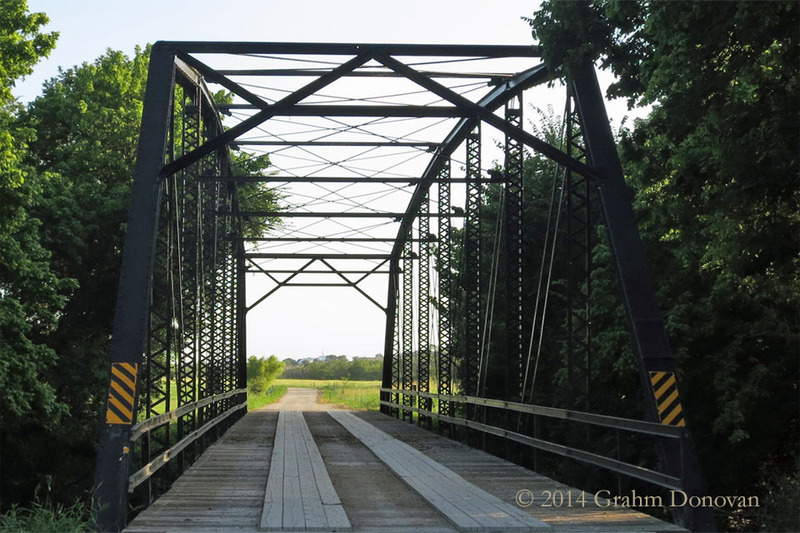 Sadly, the bridge was closed in 2014, and some of the guardrails have been stolen. Please be very cautious if you visit this bridge. Reference: The TexasExcapes Coupland page contains information about the town and the movie. 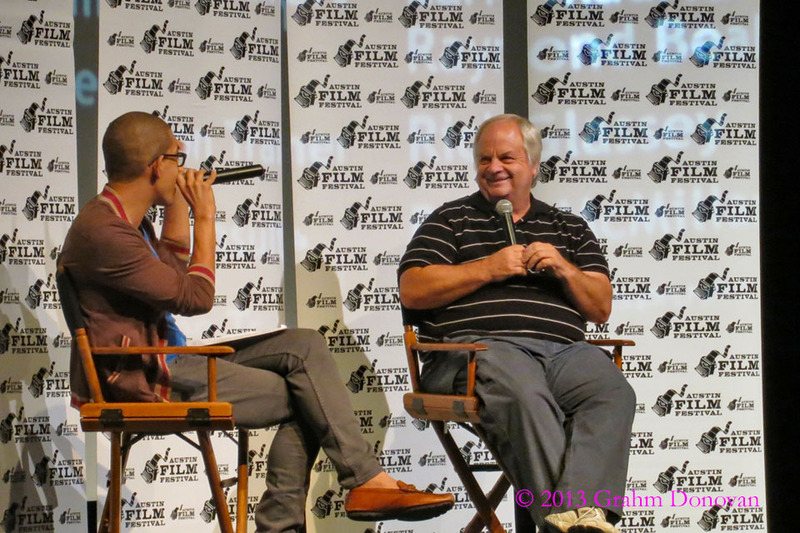 I was fortunate in 2013 to see a screening of Secondhand Lions with a "Q and A" session with director Tim McCanlies. It was a terrific experience to hear him discuss the movie, and he comes across as being similar to his Hub and Garth characters, a kindly man who "does not suffer fools gladly." The screening was presented at the Bullock Texas State History Museum in coordination with the Austin Film Festival. The Bullock Museum is a fantastic resource for Texas history, and they occasionally host films with Texas roots in their Texas Spirit Theater. Secondhand Lions © 2003 New Line Productions, Inc.